The Hawai‘i Electric Light Company announces that the companies achieved a consolidated 27% renewable portfolio standard in 2017, up from 26% the year before. The increase was achieved primarily by the addition of new grid-scale and private rooftop solar systems. Hawaiian Electric, Maui Electric and Hawai‘i Electric Light are well on their way to achieving the next mandated RPS milestone, 30% by 2020. RPS represents the renewable energy used by customers as a percentage of total utility sales. Hawai‘i Island, with a mix of geothermal, solar, wind and hydroelectricity, had the highest renewable percentage at 57%, up from 54% in 2016. Maui County was at 34%, compared with 37% in 2016, and O‘ahu was 21%, up from 19% in 2016. Maui saw a decline due to a decrease in the available wind energy. Maui Electric used 95% of the total wind power available, the highest percentage ever accepted from the island’s three wind farms. The three companies also track the peak renewable energy production for the year. These peaks are typically achieved on sunny, windy days when demand for electricity is low and renewable production is high. The peak on Hawai‘i Island was reached on Sunday, Dec. 3, 2017 when 83% of electricity demand was met by renewables. The peak was 77% on Maui on Sunday, June 4, 2017 and 53% on Thursday, Aug. 17, 2017 on O‘ahu. On O‘ahu, the 27.6-megawatt Waianae Solar project began operation in early 2017 and is the largest solar installation in the state. Private rooftop solar accounted for more than 70% of the 109 megawatts of new PV generation that came online on the five islands of the companies’ service territory last year. Annually, those new resources will displace more than 350,000 barrels of oil used for power generation. The next milestone on Hawai‘i’s path to 100%, renewable energy will be in 2020 when the renewable portfolio standard requirement is 30%. The companies expect to integrate hundreds of megawatts of new renewable generation by mid-2019. 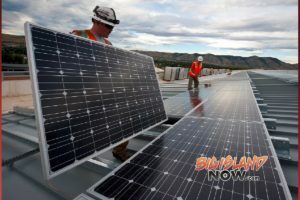 There are four grid-scale solar projects and a biofuel-capable power plant under construction on O‘ahu and two grid-scale solar projects close to completion on Maui. Continued growth of private rooftop solar is expected on all islands. The Hawaii Public Utilities Commission (PUC) has accepted the Hawaiian Electric Companies’ plan charting the near-term actions that will lead to 100 percent of Hawaii’s power generation needs coming from renewable resources to meet 100 percent of Hawaii’s power generation needs by 2045. The Power Supply Improvement Plan Update accepted by the PUC on July 14 describes the work by Hawaiian Electric, Maui Electric and Hawaii Electric Light that will form the foundation to meet or exceed the state’s renewable energy milestones, the most ambitious in the country. “After review, commission has reasonable assurance that many of the actions identified … are credible, supported by sound judgment and analysis, informed by stakeholder input and consistent with state energy policy and prior commission orders,” the commission stated. The plan describes several key goals, including acquisition of nearly 400 megawatts of new renewable energy resources by 2021. The commission urged the companies to move quickly on a “transparent, timely and successful procurement process” to work with project developers and capture federal investment tax credits before they expire. The companies followed an open, collaborative process to develop the plan, participating in multiple stakeholder workshops and technical conferences to share information and ideas. Planners used industry-leading tools and techniques to analyze multiple scenarios to balance the desires for reliability, affordability and sustainability. Among the participants in planning were the state Consumer Advocate; County of Hawaii; County of Maui; Ulupono Initiative; Blue Planet Foundation; Hawaii Gas; Paniolo Power on Hawaii Island and the state Department of Business, Economic Development and Tourism. Additional independent technical analysis was provided by the U.S. Department of Energy, National Renewable Energy Laboratory, Hawaii Natural Energy Institute and Electric Power Research Institute. The plan emphasizes work that is in progress or planned over the next five years on each of the five islands served by Hawaiian Electric, Maui Electric and Hawaii Electric Light. At least 100 percent by the end of 2040; the mandated goal is 70 percent. This would be five years ahead of the 2045 deadline to reach the goal of 100 percent renewable energy. By 2020, Hawaii Island is forecast to reach an RPS of 80 percent; Maui 63 percent; Lanai 59 percent and Oahu, 40 percent. On Molokai, Maui Electric is working with the community on options for reaching 100 percent RPS by 2020. To maintain reliability of electric service, the plan calls for adding energy storage and other grid technologies to accompany new renewable resources. The plan includes continued growth of private rooftop solar and describes the work to expand and upgrade grid infrastructure and to use the newest generations of inverters, control systems and energy storage to help reliably integrate an estimated total of 165,000 private systems by 2030, more than twice today’s total of 79,000. The Hawaiian Electric Companies already have the highest percentage of customers using rooftop solar of any utility in the U.S. The national average is one percent while the percentage in the Hawaiian Electric Companies service territories is 17 percent. To mark Earth Day 2017, the Hawaiian Electric Companies today noted their progress in replacing fossil fuels with renewable resources for power generation, reducing greenhouse gas emissions and leading efforts to switch to zero-emission electric vehicles. Many of the companies’ ambitious clean energy goals are described in the Power Supply Improvement Plan submitted to the Public Utilities Commission in December 2016. The plan calls for reducing operations that use fossil fuels, doubling private rooftop solar systems and aggressively seeking grid-scale renewable resources, among other goals. The Hawaiian Electric Companies reached a milestone in 2016, with 26 percent of the electricity used by customers coming from renewable resources – up from 23 percent the year before. Hawaii Island customers’ use of renewable electricity passed the halfway mark for the first time, with 54 percent of electricity coming from renewables, up from 49 percent in 2015. Maui County also reached a new high of 37 percent, up from 35 percent. On Oahu, 19 percent of electricity used by customers was from renewable resources, up from 17 percent the year before. The Power Supply Improvement Plan forecasts exceeding the state’s renewable energy milestones of 30 percent in 2020, 40 percent in 2030, 70 percent in 2040 and 100 percent by 2045. Renewable goals exist to increase self-sufficiency by relying on local resources like sun, wind, geothermal, local crops and waste. The companies’ ultimate goals are to reduce dependence on imported oil and climate-altering greenhouse gas (GHG) emissions, especially carbon dioxide. From 2008 to 2016, Hawaiian Electric’s use of oil in generators on Oahu fell to 6 million barrels from 7.8 million barrels. For all three Hawaiian Electric Companies, oil use fell to 8.5 million barrels from 10.7 million barrels, a 21 percent decrease. The number of registered plug-in electric vehicles (EV) has broken the 5,000 mark, a promising milestone that makes Hawaii second in the nation after California in EVs per capita. Hawaiian Electric has helped form Drive Electric Hawaii to accelerate adoption of electric vehicles through coordinated efforts and make it easier to expand vehicle-charging infrastructure in a way that brings more renewable energy onto the electric grid. A dozen fast chargers are available at shopping centers, visitor attractions and on utility property across the five islands the companies serve. More are coming. Transactions at our companies’ fast chargers shot up in March as EVs on the road increased and drivers became more aware of the growing number of fast chargers. For more about environmental progress, visit: http://www.hawaiianelectric.com/about-us/our-commitment. The Hawaiian Electric Companies are adding capacity to the Customer Grid-Supply (CGS) program that credits solar customers for the excess electricity they send to the grid. A recent decision by the Hawaii Public Utilities Commission (PUC) created space in the CGS program by transferring it from private rooftop solar systems that were approved in the past several years but never completed. The CGS program at all three utilities last year reached the capacity caps set by the PUC. To enable more customers to enroll, the companies proposed that space be transferred from approved but long-inactive rooftop projects. Estimates show at least 20 megawatts of CGS capacity is available for customers of the three companies, representing about 2,800 private rooftop solar systems. More than half of that capacity is on Oahu. Hundreds of CGS applications are already in line for processing. Those applications will be processed in the order received and only as capacity becomes available through Oct. 21, 2017. Customers interested in submitting an application should first review our Going Solar webpage and check the online Locational Value Maps to determine if the circuit serving their neighborhood has room for more solar. If the circuit is saturated, equipment upgrades might be required, potentially adding to the cost and time needed for approval. To allow for more integration of private solar, the Hawaiian Electric Companies are testing the latest technologies, including advanced inverters that may be used to improve circuit conditions. Hawaiian Electric advises grid-supply applicants to install a “right-sized” system calculated for their household’s actual energy use rather than an oversized system designed mainly to sell electricity to the grid. Oversized systems cost more and can potentially export more electricity than the homeowner will receive credit for on their electric bill. By using Solar WattPlan, the companies’ online calculator, customers can determine what size system is right for them. Installing a “right-sized” system helps leave room for future interconnections on the circuit, making space for others. The Hawaiian Electric Companies lead the nation in the adoption of solar power. Nearly 78,500 customers have had their systems approved or installed on Oahu, Maui County, and Hawaii Island. To date, 16 percent of all customers have PV systems – nearly 20 times the national average. In the aftermath of powerful windstorms that swept through the state on Saturday, Hawaiian Electric, Maui Electric and Hawaii Electric Light crews continue their work today to restore service to thousands of customers who remain without power. Winds remain gusty across the islands today and more outages are likely. According to preliminary assessments, damage to electrical equipment from the windstorms was some of the most widespread in years, affecting customers on each of the five islands served by Hawaiian Electric, Maui Electric and Hawaii Electric Light. Presently, all 1,700 customers on Lanai are without power and are being asked to plan for an extended outage as crews work to safely restore power. On Oahu, there were more than 100 separate outages in the past 24 hours, affecting about 100,000 customers. All but about 1,900 in Palolo had been restored by this morning and there are still dozens of localized outages across the island, including in Makaha, Waianae, Wahiawa, Manoa and Kalihi. After high winds snapped or damaged 19 utility poles on Lanai yesterday, Maui Electric crews are continuing restoration efforts today. The estimated time of restoration for Lanai City is by 11 p.m. tonight, with the Manele area to follow by Monday evening. On Maui, crews are working to restore about 560 customers in pockets of Upcountry Maui and Paia. On Molokai, Hawaii Electric Light crews will arrive later today to assist Maui Electric with the restoration of power to a radio tower. Currently no other customers are out. Hawaii island experienced scattered outages caused by branches in lines, affecting about 7,500 customers over the past 24 hours. The largest outage was in the Waimea-Kawaihae area affecting about 2,700 customers Saturday night. All customers on the island have been restored. Customers are reminded to stay away from downed power lines since they could be energized and are extremely dangerous. Do not touch these lines. Stay away from downed power lines – at least 30 feet or more. Report downed lines immediately by calling Hawaiian Electric’s Trouble Line; the number is 1-855-304-1212, available 24 hours a day, 7 days a week. If you see someone injured after touching a downed power line, call 9-1-1 for help. Don’t try to rescue the individual because electrical current can travel through them to you and you risk becoming a victim yourself. Always assume downed power lines are energized and dangerous. A downed line touching a fence or guard rail can energize it for several thousand yards and pose a hazard to anyone coming into contact with these structures. Don’t run away; instead, keep your legs together and shuffle away with both feet on the ground to a safe distance (30 feet or more). Remain where you are, if possible, and call and wait for help. If you must get out of the car because of a fire or other hazard, jump free of the car, hopping with both feet together so that your body clears the vehicle before touching the ground. Once you clear the car, shuffle at least 30 feet away, with both feet on the ground. Never step down or simultaneously touch the ground and equipment that is in contact with the power line, as this will increase the risk of electrical shock. The Hawaiian Electric Companies will offer a special medical needs discount rate for customers of all three companies. This pilot is subject to Hawaii Public Utilities Commission approval to go into effect on April 1, 2017 for two years. Up to 2,000 customers dependent on life support equipment or increased heating and cooling needs due to a medical condition verified by a physician may save up to $20 a month on the first 500 kWh of energy use. Use above 500 kWh will be charged at regular residential rates. Dependent on life-support devices used in the home to sustain life or relied upon for mobility as determined by a licensed physician, including but not limited to: aerosol tents; apnea monitors; hemodialysis machines; compressors; electric nerve stimulators; pressure pumps; electrostatic nebulizers; and intermittent positive pressure breathing machines. A paraplegic, hemiplegic, quadriplegic, multiple sclerosis or scleroderma patient with special heating and/or cooling needs. Based on the number of applicants, the Hawaiian Electric Companies will determine whether to continue the rate after two years. Residential customers with anyone in the home dependent on life support or emergency equipment are encouraged to inform their island utility of that fact by calling customer service today so they can be notified about future planned maintenance outages. However, because unplanned outages can occur, it is essential that customers with life support or emergency equipment needs make alternate plans should the power go out. Consistent with the Hawaiian Electric Companies’ updated energy action plans, Maui Electric Company and Hawaii Electric Light Company has asked the Hawaii Public Utilities Commission (PUC) to start the process to seek new renewable energy generation on Maui, Lānaʻi, Molokaʻi and Hawaii Island. To ensure customers benefit from these projects as soon as possible, this effort is targeting projects that can be in service by the end of 2020. The energy plan update, submitted to the PUC on Dec. 23, 2016, envisions achieving 100 percent renewable energy on Molokai by 2020, Lānaʻi by 2030, and Maui and Hawaii Island by 2040. Following established regulatory rules, Maui Electric and Hawaii Electric Light are asking the PUC to open dockets to facilitate issuing formal requests for proposals (RFPs) for new renewable energy projects and to appoint an independent observer (IO) to oversee the procurement process. A separate RFP would be issued for each island. Appointing an independent observer early in the process would allow the collaborative design of the RFPs and associated technical, operational, and performance requirements for renewable energy proposals. Once the PUC approves the RFP design, the companies will release the RFPs that will provide details to prospective bidders on the renewable energy being sought for each island. Maui Island is currently at more than 35 percent renewable energy. Hawaiian Electric is awaiting approval from the PUC for a similar request for Oahu submitted in June 2016. To help accelerate and inform efforts to achieve 100 percent renewable energy, the Hawaiian Electric Companies today launched an effort to gather information about land that may be made available for future renewable energy projects that will benefit all electric customers. Hawaiian Electric, Maui Electric, and the Hawaii Electric Light Company are issuing a Request for Information (RFI) which asks interested landowners to provide information about properties on Oahu, Hawaii island, Maui, Molokai, and Lanai available for utility-scale renewable energy projects, such as solar and wind farms, or for growing biofuel feedstock. “Land is one of the most important resources to consider in the development of renewable energy projects. By proactively identifying potential sites, we are hoping to make the process of developing renewable energy projects faster and more efficient for both land owners and prospective developers,” said Shelee Kimura, Hawaiian Electric vice president of strategic planning and business development. To reach 100 percent renewable energy, Hawaii will need a broad mix of renewable energy resources. Continued growth of private rooftop solar energy systems and energy storage will offer customers more options. These resources will be complemented by additional large-scale projects, which will help ensure all customers receive the benefits renewable energy. Interested parties should submit responses to the RFI by Jan. 27, 2017. For more information, go to www.hawaiianelectric.com/landRFI or email landrfi@hawaiianelectric.com. Malama Maunalua was awarded a $15,000 grant from the Hawaiian Electric Companies to support critical conservation projects in Maunalua Bay. The grant was presented by Sean Moura, Hawaiian Electric’s wildlife biologist and an environmental scientist in the company’s Environmental Department, during a community workday at the Bay. “This award from the Hawaiian Electric Companies is an important investment in the restoration of Maunalua Bay, which is such a significant, yet fragile marine resource. We are very grateful to the Hawaiian Electric Companies for joining other organizations in making our projects with the community and scientists possible,” said Jennifer Taylor, Board President. Hawaiian Electric’s grant will help expand the Habitat Restoration Program which includes increasing community “huki” (pull) events where volunteers assist in removing invasive alien algae, launching an initiative to restore native sea grass, developing a bay algae consortium to address the implementation of restoration techniques and monitoring, and expanding community engagement through research, internships and careers. In addition, a priority for Malama Maunalua is the development of a partner-supported knowledge geo-database to be used to guide management priorities and strategic uses for the bay. Malama Maunalua is a community based non-profit organization committed to restoring the health of Maunalua Bay, the near shore area in East Oahu which stretches from Black Point to Portlock Point. Malama Maunalua focuses on reducing the three major threats to Maunalua Bay – removing invasive alien algae, reducing run-off of sediment and pollutants and increasing marine life. Malama Maunalua is finding solutions to these problems through working with thousands of community volunteers and collaborating with community and conservation partners and government agencies. Volunteer board members are Jennifer Taylor (President), Mitch D’Olier (Vice President), Jean Tsukamoto (Treasurer), Amy Monk (Secretary), Dawn Dunbar, Steve Schatz and Dr. Leighton Taylor. To donate to the organization or to participate in a community workday, visit www.malamamaunalua.org or contact info@malamamaunalua.org. The Hawaiian Electric Companies today asked the Hawai’i Public Utilities Commission (PUC) to review and approve a proposed contract with Fortis Hawaii Energy Inc. to import liquefied natural gas (LNG) for electricity generation on O’ahu, Hawai’i Island and Maui. The contract, the culmination of a request for proposals issued two years ago, would provide a cleaner, low-cost fuel to replace oil in the transition to achieving Hawai’i’s 100 percent renewable portfolio standard by 2045. If approved, Hawaiian Electric envisions beginning use of natural gas in 2021 with a 20-year contract ending as Hawai’i approaches its 100 percent renewable energy goal. At the same time, Hawaiian Electric is asking the PUC for authorization to construct a modern, efficient, combined-cycle generation system at the Kahe Power Plant to get the maximum customer benefits from use of cleaner, less expensive natural gas; better support integration of renewable energy; and facilitate retirement of three older, oil-fired generators at the Kahe Power Plant. The Fortis Hawaii contract is also contingent on PUC approval of the merger of Hawaiian Electric with NextEra Energy. This project requires substantial upfront financial support and expertise that NextEra Energy can provide. If the merger is not approved, the Hawaiian Electric Companies would still be interested in pursuing on their own the benefits of LNG for customers, but the companies would need to negotiate a new contract which likely would mean lower, delayed savings for customers and delayed benefits for the environment. Hawaiian Electric estimates the natural gas contract and greater efficiencies from modernized generation could save electricity customers from $850 million to $3.7 billion through 2045, depending on future oil prices. At the same time, annual oil imports for electricity generation would be reduced by over 8 million barrels, or 80 percent, as soon as 2021. Hawai’i’s carbon footprint would be reduced by significantly cutting greenhouse gas emissions. The reduction of over 4 million tons in carbon dioxide emissions alone equals taking more than 80 percent of Hawai’i’s passenger vehicles off the road. Savings on electric bills for typical residential customers using 500 kilowatt-hours a month, when compared to alternative generation planning scenarios using oil, could be as much as $390 a year for O’ahu customers. Savings for Hawai’i Island and Maui customers are estimated at $100 and $15 per year, respectively. The savings take into account the estimated $341 million cost of converting existing generating units to use natural gas at Kahe Power Plant on O’ahu, Mā’alaea on Maui, and Keahole and Hāmākua Energy Partners on Hawai’i Island, and the estimated cost of $117 million for LNG containers. The logistics system to deliver and offload the LNG will not require development of new infrastructure off- or on-shore in Hawai’i. “We know Governor Ige has expressed opposition to importing LNG,” Cox said. “However, we have just reached contract terms with a supplier after a long negotiation and now have much more than a theoretical plan for the governor, Public Utilities Commission, energy stakeholders and the public to consider. We believe we have a responsibility to put forward an option that has significant economic and environmental benefits for the people of Hawai’i, and that addresses some of the Governor’s concerns. “This proposal, negotiated with the added expertise and experience of NextEra Energy as an advisor, will support achieving our 100 percent renewable energy goals. It will allow us to integrate increasing amounts of renewable energy at much lower cost while providing more reliable service for our customers. Further, our plan keeps new LNG infrastructure, both on- and off-shore, to a minimum and preserves flexibility to reduce LNG imports as renewable energy increases,” Cox said. For 50 years, natural gas has been safely transported around the world in liquefied form for use in power generation. It is subject to strong international, national and local regulation and monitoring for safety and environmental protection. For Hawai’i, this proposal will provide enhanced security of fuel supply by avoiding the risk of sourcing fuel from more remote and politically unstable locations. Under the proposed plan, Fortis — a leader in the North American electric and gas utility business — would liquefy the gas piped from northeastern British Columbia at its Tilbury facility in Delta, near Vancouver. The LNG would be transported from British Columbia to Hawai’i in mid-sized LNG carrier ships. The Hawaiian Electric Companies would use natural gas in power plants to generate the electricity delivered via island power grids to homes and businesses where customers will use the same electric water heaters, stoves, refrigerators and other appliances as today. As with all fuel purchases and purchased power, the actual cost of the natural gas would be passed directly to customers on electric bills, without mark-up or profit to the Hawaiian Electric Companies. payments if the Hawaiian Electric Companies decide to take less than the full capacity commitment of LNG; for example, if more renewable resources come online more quickly than expected. The vessels and trucks (owned by others) and the containers to import LNG under this plan are modular and movable so a significant portion can be resold or repurposed when no longer needed to serve power generation in Hawai’i. The carrier ships, barges and possibly the trucks to deliver LNG to power plants will be fueled by LNG, further reducing oil use in Hawai’i. To gain the greatest savings for customers and better ensure reliable service as the integration of renewable energy increases from variable sources like sun and wind, Hawaiian Electric also proposes to modernize the generation fleet on O’ahu. Three steam generators at the Kahe Power Plant (Units 1-3) would be deactivated by the end of 2020 when each will be over 50 years old and replaced with an efficient, combined-cycle generation system located at the plant further from the shoreline than the existing units. The location provides greater energy security, for example from tsunamis, and a less visible profile. The combined-cycle system would include three modern, quick-starting, fast-ramping combustion turbines with three heat recovery steam generators and a single steam turbine to generate power using the waste heat that is recovered. This flexible, fuel-saving combination would be 30 percent more efficient than the deactivated generators. This modern generation is needed to balance the increasing amounts of variable renewable energy being added as Hawai’i transitions to 100 percent renewable energy. The combined-cycle system will be capable of using renewable biofuels. Measured against current levels, the combined generation modernization and natural gas plan produces lower carbon dioxide emissions by over 4 million tons when fully operational. To secure these benefits for customers as quickly as possible and ensure reliable service as the new combined-cycle system replaces old generating units, Hawaiian Electric is seeking Public Utilities Commission permission to construct the new generating system with an estimated in-service date of January 2021. The proposed combined-cycle system is intended to be responsive to these PUC concerns. The estimated cost for modernized generation at Kahe Power Plant and to interconnect the new system to the grid is $859 million. This cost is factored into the overall savings projected for the LNG plan. The Hawaiian Electric Companies’ plan also proposes using natural gas in two remaining Kahe units (5-6) and the Kalaeloa Partners power plant on O’ahu. In addition, natural gas is proposed for use on Maui at Mā’alaea Power Plant and on Hawai’i Island at Keahole Power Plant and the Hāmākua Energy Partners plant. Natural gas could also be used at the planned Schofield Generating Station and other future generating sites to provide savings for customers. An Environmental Impact Statement will be prepared. In addition to thorough Public Utilities Commission review with input from the Consumer Advocate, community stakeholders and others will have many opportunities for input through the extensive environmental review and permitting approval process. Additional details are available in the accompanying fact sheet. “At the Hawaiian Electric Companies, we know the challenges in providing a comfortable learning environment for our students and teachers,” said Jim Alberts, Hawaiian Electric senior vice president for customer service. “There’s been a big push for air conditioning and fans in our public schools so we wanted to find a way to assist in controlling their energy costs as they add this equipment. “Our goal in proposing these rates is to give the Department of Education the opportunity to expand air conditioning in classrooms across the state with a tool to manage the increase in electricity use that could really hit a school’s utility budget,” he said. Hawaiian Electric estimates that the Department of Education would have saved about 9 percent on electric bills for the twelve months ended June 2015 had the proposed rates been in effect. These savings could help offset the increase in costs as more air-conditioning and cooling equipment is added. The lowest rate – about 25 percent less than the recent average effective energy charge –from 8 a.m. to 4 p.m. (super off-peak hours). A rate that is the same as the existing energy charge rate from midnight to 8 a.m. (off-peak hours). A rate that is higher — above the existing energy charge rate — from 4 p.m. to midnight (on-peak hours). These rates are also designed to encourage more electricity use during the hours of the day when renewable energy – particularly solar – is adding more low cost electricity to the grid. In addition, by designing time-of-use rates to better match demand with energy supply, the utilities may also reduce the need for additional system resources, including utility generation, during evening peak hours. The new rates provide educational as well as operational opportunities for students and teachers as well as administrators to see each participating school’s energy use. With the additional grid intelligence from the Hawaiian Electric Companies Smart Power for Schools’ program, electricity use trends with the proposed DOE time-of-use rates can be monitored, managed and evaluated by both the DOE and Hawaiian Electric Companies to refine the rate schedules in the future. The proposed new rates are called “Schedule DOE-J, Commercial Time-of-Use Service” and “DOE-P, Large Power Time-of-Use Service.” Most schools would fall under the DOE-J rate. Hawaiian Electric is asking the PUC to allow these rates to go into effect by January 5, 2016 and stay in effect for ten years, through four to five of the Department of Education’s two-year budget cycles to ensure proper evaluation of the stated objectives. The Hawaiian Electric Companies are also developing time-of-use rate proposals that other customers will be able to take advantage of to help manage their energy costs and support renewable energy. Those proposals will be submitted to the PUC this month. As part of its transformation to deliver a more affordable, clean energy future for Hawaii, the Hawaiian Electric Companies are proposing a new program to increase rooftop solar in a way that’s safe, sustainable and fair for all customers. In conjunction with this “Transitional Distributed Generation” program, the utilities expect to be able to help the growth of solar by more than doubling the threshold for neighborhood circuits to accept solar systems. This would eliminate in most of those cases the need for a longer and costly interconnection study. Under the proposal, existing Net Energy Metering (“NEM”) program customers and those with pending applications would remain under the existing NEM program. Any program changes from this proposal would apply only to new customers. The initiative is part of the Hawaiian Electric Companies’ clean energy transformation to lower electric bills by 20 percent, increase the use of renewable energy to more than 65 percent, triple the amount of distributed solar by 2030, and offer customers expanded products and services. Currently, NEM customers use the electric grid daily. Their rooftop solar systems send energy into the grid, and they draw power when their systems do not provide enough for their needs, including in the evenings and on cloudy days. However, many NEM customers are able to lower their bills to the point that they do not help pay for the cost of operating and maintaining the electric grid. As a result, those costs are increasingly being shifted from those who have solar to those who don’t. The new transitional program would create a more sustainable system and ensure the costs of operating and maintaining the electric grid are more fairly shared among all customers. Under the current NEM program, customers receive credit on their electric bills at the full retail rate for electricity they produce. This credit includes the cost of producing electricity plus operation and maintenance of the electric grid and all other costs to provide electric service. The Transitional Distributed Generation program would credit customers at a rate that better reflects the cost of the electricity produced by their rooftop solar systems. This is consistent with how Kauai Island Utility Co-Op compensates its solar customers. If this transitional program is approved, the Hawaiian Electric Companies expect to be able to modify their interconnection policies, more than doubling the solar threshold for neighborhood circuits from 120 percent of daytime minimum load (DML) to 250 percent of DML. In many cases, this will eliminate the need for a longer and costly interconnection study. To safely integrate higher levels of solar, rooftop systems will need to implement newly developed performance standards, including those established using results of a collaboration among Hawaiian Electric, SolarCity and the Electric Power Research Institute. Through this partnership, the performance of solar inverters was tested at the National Renewable Energy Laboratory in Golden, Colorado. These standards can reduce the risk of damage to electronics in a customer’s home and to utility equipment on the grid, safety hazards for electrical line workers, and even widespread power outages. The Hawaiian Electric Companies will also make strategic and cost-effective system improvements necessary to integrate more rooftop solar. They will work with the solar industry to identify areas where demand for upgrades is highest. Planning for these upgrades will also consider the needs of the State of Hawaii’s Green Energy Market Securitization (GEMS) program, which will make low-cost loans available to customers who may have difficulty financing clean energy improvements like solar. To further support even more customers adding solar on high solar circuits, Hawaiian Electric will also be doing several pilot projects for “Non-Export/Smart Export” solar battery systems with local and national PV companies in Hawaii. These projects will provide real-world operational experience on their capability to increase solar interconnections on high-penetration circuits. The company is also developing a community solar program as another option to help make the benefits of solar available to all customers, including those who may not be able to install rooftop solar (for example, renters or condo dwellers). Hawaiian Electric is asking the PUC to approve the new program within 60 days. Under the utilities’ proposal, the Transitional Distributed Generation program would remain in effect while the PUC works on a permanent replacement program, to be developed through a collaborative process involving stakeholders from across the community, including the solar industry. Across the three Hawaiian Electric Companies, more than 51,000 customers have rooftop solar. As of December 2014, about 12 percent of Hawaiian Electric customers, 10 percent of Maui Electric customers and 9 percent of Hawaii Electric Light customers have rooftop solar. This compares to a national average of one-half of 1 percent (0.5 percent) as of December 2013, according to the Solar Electric Power Association. This evening on the Big Island of Hawaii, residents across the island reported that they had lost electricity for a time tonight. From Puna to Kona the outages were reported. Hawaiian Electric Companies is currently investigating the power failure but has tentatively classified this as a “frequency trip on the system”. When they have determined the exact cause of the island-wide outage I will update this post. The Hawaiian Electric Companies are now sharing “Renewable Watch” for Oahu, Maui and Hawaii Island, online displays that show the daily contribution of solar and wind generation on each island and how energy from these resources changes throughout the day. The orange line measures the amount of energy produced by PV throughout Hawaii Island. The green line measures the wind energy production from wind facilities on Hawaii Island. The blue line represents the net system load, which is the amount of energy met by utility generation. The light blue line is the gross system load, which is the total demand, or the total amount of electricity used by customers, on the system. This demand is met by a combination of what is served by the utility and what is provided by local distributed systems, such as PV on rooftops. The difference between the blue and light blue lines represents the estimated aggregated distributed generation produced by local PV generation. This estimate provides a good estimate of how much energy is being produced by rooftop PV systems without our having to meter every rooftop PV system. This perspective provided operations and planning personnel with the information to gauge the impact of rooftop PV on system load and helped explain the decrease in mid-day load. Displays for each island can be found on the homepage under Clean Energy Future at www.hawaiianelectric.com for Oahu, on www.mauielectric.com for Maui Island and www.hawaiielectriclight.com for the Island of Hawaii. The Solar Electric Power Association ranks Hawaii number one in the nation for solar watts per customer. At the end of 2013, over 40,000 solar installations across the three companies’ service territories had a combined capacity of about 300 megawatts. To maintain reliable electric service for all customers, utility engineers must adjust the output of firm sources of generation up or down as the output from variable sources like solar and wind rises and falls throughout the day. The Hawaiian Electric Companies developed “Renewable Watch” to help system operators and engineers obtain information about the contribution of energy from the variable solar and wind resources. “This information can help us integrate higher levels of renewable energy more effectively. Solar and wind power are increasingly important to our energy mix, so we need to understand when and how these resources affect our system,” Seu said. Data from wind facilities and utility-scale solar facilities for “Renewable Watch” comes from utility system-monitoring equipment. Data for customer-sited solar power comes from regional estimates using solar sensors strategically placed throughout the islands and other sources. Solar sensors monitor irradiance (the rate at which solar energy falls onto a surface) to help estimate the energy generated by thousands of PV systems across the island. Displays of additional renewable resources will be added to “Renewable Watch” screens as they come online. The Hawaiian Electric Companies – Hawaiian Electric, Maui Electric, and Hawaii Electric Light – launched their Facebook page: www.Facebook.com/HawaiianElectric. We will be posting daily, offering safety and clean energy tips, updates on community events, and the latest information on our companies and employees. Kicking off the launch is our Power Sweepstakes, a social media-based contest open to Hawaii residents 21 years and older. The sweepstakes asks that our customers “Like” the Hawaiian Electric Facebook page, as well as follow its Twitter accounts, for chances to win prize bundles that include an Apple iPad Air, Apple iPad mini , and solar-charging backpacks. Details and official rules for the Power Sweepstakes rules may be found at www.HawaiianElectric.com/Power. Outage notifications are being tweeted on @HwnElectric using the hashtag #OahuOutage.